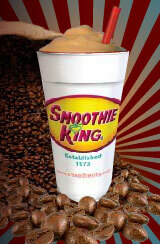 Smoothie King is promoting their 6 new coffee-based smoothies by giving away a FREE 20oz. Coffee or Mo'cuccino smoothie anytime before 10:30 AM on Thursday, September 18. Mark your calendars! The coffee smoothies include Gladiator protein to for an energy boost, while the Mo'cuccino mixes java with ice cream and protein. "Because the coffee in Smoothie King's new line of smoothies is cold-brewed processed, more than 70 percent of the bitter acids and oils are removed, providing a smoother flavor and resting easier on the stomach." The Coffee Smoothies and Mo'cuccinos come in 3 varieties: Caramel, Mocha and Vanilla.